hopefully this person will be caught! Just wanted to pass this along. On Monday December 15th at 645PM Congressman Robert “Bobby” Scott will speak before the Wards Corner Civic League at the Norfolk Fitness and Wellness Center. His Congressional District encompasses much of the Greater Wards Corner area. As President of the Wards Corner Civic League I am cordially inviting you to attend our civic league meeting and hear what Congressman Scott has to say and have a chance to meet and ask him your questions. While we have been trying to get him to speak to our members for the last two months it wasn’t until Friday afternoon that I was called by his office and told that he would be available to attend our meeting. Hence the short notice. Since he hasn’t been to our meeting in some time please take this opportunity to come out and hear him. I am sure he will have a lot to say about the current situation/s in Washington as we prepare to inaugurate a new President. I have also invited Senator Northam, Delegate Miller and our city council representatives. We look forward to seeing you there Monday night. The Virginia Department of Transportation (VDOT) has scheduled a citizen information meeting tonight on possible Hampton Roads Bridge-Tunnel (HRBT) congestion solutions. Transportation officials will outline a Draft Expansion Feasibility Study of the Hampton Roads crossing on Interstate 64 and present several preliminary concepts for the expansion of the interstate network. The citizen information meeting will be held from 6 p.m. to 8 p.m., with a project presentation at 7:00 p.m., followed by a question and answer period. Police are investigating a shooting in the 600 block of Thole Street. According to police a man was shot outside a Tinee Giant convenience store about 4:30 p.m. during what may have been an attempted robbery. The man’s injuries are not considering life-threatening, police said. This shooting happened on December 8, 2008. You may have already heard that this Saturday Granby High School students and Ward’s Corner Businesses are joining efforts to work in the area to pick up trash. Business students will participate in order to earn community service hours as well as learn the rewards of giving back to the community. In addition, another group of students from the general population at Granby will help out. These students are interested in being sponsored financially to register and run in the Virginia Beach Shamrock 1/2 marathon. Last year we had 57 students who set a goal to train for, and finish a half-marathon. It wasn’t about speed, but about positive, healthy choices. Our kids finished in times ranging from 1:36 to 4:45, but all had fun. There was such camaraderie among the students with the group runs, and friendships were forged that would never have happened otherwise. Every kid felt successful! This year we have upwards of 100 students who want to participate. The Shamrock organizers, (Jerry and Amy Frostick) are assisting with some financial help. The store, Final Kick, is sponsoring several fund-raisers, but we need more help. Last year, we were able to raise some money,but with so many participants, it’s quite a task. Do the math—–we need about $7500 !!!! Anything the WCBOA could do to help would be greatly appreciated! I will be at the December meeting to give more details and suggest ways that you can help. Come out on Saturday and meet the students. My cell phone is 619-5962, home is 340-4905. Rain date is Dec. 13th. Bon Secours will announce today that they will partner with Sentara on a Princess Anne, Virginia Beach Hospital. 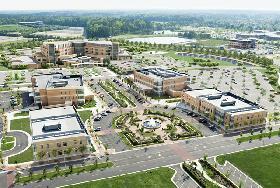 Both Bon Secours and Sentara had proposed two new hospitals for the Princess Anne area of Virginia Beach. Hopefully, this will free up cash for Bon Secours to develop a world class health campus at the new DePaul Medical Center. What seems certain is that major neighborhood initiatives in Wards Corner, Broad Creek, Southside and Fairmount Park will survive. City Planning Director Frank Duke said the fate of 19 plans must be decided by the Norfolk Redevelopment and Housing Authority’s board of commissioners. That leaves 62 in the hands of the City Council. You are currently browsing the Wards Corner Now - Wards Corner, Norfolk, Virginia blog archives for December, 2008.